Home » ENT (Ear-Nose-Throat) » Should You Have Your Tonsils Removed? 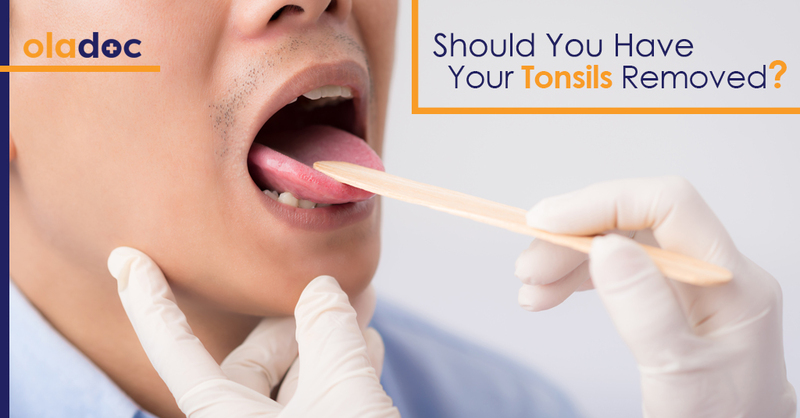 Should You Have Your Tonsils Removed? Frequent in children and rare in adults, tonsil infections are often no more than a bad case of sore throat, sometimes requiring antibiotic treatment in case of a bacterial infection. Therefore, surgical removal of tonsils is reserved mostly for children with recurrent or chronic tonsillitis and allergies to antibiotics. Infection or allergy induced abnormal tonsil enlargement might block the nasal passages. This causes forced mouth-breathing, a dry mouth and adverse facial structure changes. It may also lead to Obstructive Sleep Apnea, a serious medical condition which causes severe breathing issues and disrupts sleep patterns. In addition to constant bad breath, halitosis also causes the formation of terrible-tasting tonsiliths (white tonsil stones) due to excessive inflammation of the tonsils. If traditional treatment fails, this condition might call for the surgical removal of the affected tonsils. Although rare, children with Lymphoma (cancer of the lymph nodes) or adults suffering from Squamous Cell Carcinoma (cancer in the epidermis, or outermost layer of the skin) might need to have their tonsils removed. Common in teenagers and young adults, abscesses are a painful collection of pus behind the tonsils, which may also spread to the neck, culminating in blocked airways and breathing difficulties. In this case, the tonsils may have to be removed is surgically draining them is not effective. In this condition, swollen adenoids block the Eustachian tube connecting the pharynx and the middle ear. This results in the formation of sticky fluid in the middle ear over time, which causes hearing difficulty and even, hearing loss. Other recurring ear infections might also lead to tonsil removal. Sometimes, throat infections can spread into the tissues surrounding the tonsils, resulting in the formation of a painful abscess known as a ‘per-tonsillar abscess’, which then causes interference in breathing and swallowing. Antibiotics or surgical drainage of the tonsils are usually applied for mild or extreme cases, respectively. Surgical removal of the commonly infected palatine tonsils lasts between 30-45 minutes minus anaesthesia. Tonsillectomy is a relatively simple outpatient (not requiring a hospital stay) procedure, commonly reserved for children. Tonsils can either be Completely Removed or Partially Removed (Intracapsular Tonsillectomy)-which is only performed in children under 3 years in order to reduce recovery pain. However, the tonsils can grow back and cause possible reinfection. Adenoidectomy is performed in children below age 4 and involves the removal of infected adenoids via Curette scraping, Electrocautery Ablation using electric current or Coblation, in certain cases. Regardless of the procedure, 5-10% adenoids grow back later in life. Tonsils may also be removed via a plasma field, which cleanly cuts the infected tonsil by dissolving the soft tissue that connects it to the neck. This results in little to no throat bleeding-a common problem in traditional tonsil-removal procedures. The procedure in total takes 30-45 minutes including anaesthesia. Commonly employed for children, T&A is the simultaneous removal of the palatine tonsils and adenoids, usually due to an infection in both tonsil types, or if the palatines are infected and adenoids are unusually enlarged and cause breathing problems. In adults, it is used as a treatment of sleep apnea. The procedure is comparatively less painful for children than adolescents and requires a 10-day recovery period. Contact a doctor immediately in case of excessive bleeding within or after 10 days following surgery. If your child is experiencing any of the above issues related to tonsils, consult with an ENT specialist as soon as possible. You can book an appointment with a top ENT Specialist in Lahore, Karachi and Islamabad through oladoc.com. Or call our helpline at 042-3890-0939 for assistance to find the RIGHT Doctor for your tonsil troubles. Yashfa Marrium is a freelance writer and health enthusiast. You can reach her at [email protected].